I hope those who were celebrating had a nice Valentine’s Day and those trying to avoid it were able to do so successfully! I must confess, I’m a lucky gal who has a truly wonderful husband. He’s amazing every day of the year with all he does for me and for us, and special occasions are no exception. The last couple of weeks his work had been extremely busy and they are having to work quite a bit of overtime, including this weekend. He has been working such long, hard days, I decided this year the best gift to give him would be a nice dinner when he got home on Valentine’s night. I thought about what to make based on his favorite things. For the dinner, I made fettuccine with shrimp, mushrooms and roasted tomatoes in a marscapone cream sauce, since he loves mushrooms and pasta and the shrimp upped the dish to something fancier than a usual dinner for us. It was incredible and I will have to post that recipe the next time I make it, because there was no way we were going to delay eating (and let the shrimp get cold) so I could get a photo last night. For dessert, Ilya’s a huge brownie fan. I think his favorite would be peanut butter, but I had just made the Ultimate Peanut Butter Cup brownies last week, so it wouldn’t be special enough if I just made those again. Likewise, I didn’t want to make any of the things that were made over the last couple of weeks to post on here. So off to Pinterest I went, perusing brownie ideas. I found the recipe these brownies were adapted from and knew right away these were it. The recipe called for using a box brownie mix and canned cream cheese frosting, but those just wouldn’t do for a Valentine’s dinner, so I used my fudgy brownie recipe and made homemade cream cheese frosting (it legit takes all of 5 minutes for homemade frosting). I didn’t have raspberry jelly but we had some raspberry preserves, so that’s what was used in mine. I taste-tested the chocolate raspberry mixture before putting it in the fridge to cool and it seemed lacking, so I added in some raspberry extract (I mean, raspberry mousse should taste like raspberries, right?). Plus there is a LOT of intense chocolate flavor going on between the brownies and the chocolate in the mousse, so I really wanted the raspberry taste to pop. In the end, they turned out perfect and were by far the most decadently delicious brownies I’ve ever made. Ilya even said they are “the greatest brownies in the history of all time”! Score! All in all Valentine’s Day dinner was a huge success taste-wise and gesture-wise, as Ilya loved the thought and effort put in to making things with his favorite ingredients. The best part of doing dinner at home is then we can just roll our super-stuffed selves over to the couch to snuggle and watch a movie (which is exactly what we did). To give an idea of what you can expect with these, the brownie portion is a dense, fudgy brownie that is all kinds of delicious, then the mousse is light and smooth and melts in your mouth. The contrast in textures is perfect, making these brownies go down real easy. I know a lot of people are reluctant to do homemade brownies, thinking they’re so much work, but they’re honestly not that much more work or time than boxed brownies yet are infinitely more delicious. Give them a whirl and you will never want to use a boxed brownie mix again (at least that’s what happened for me). 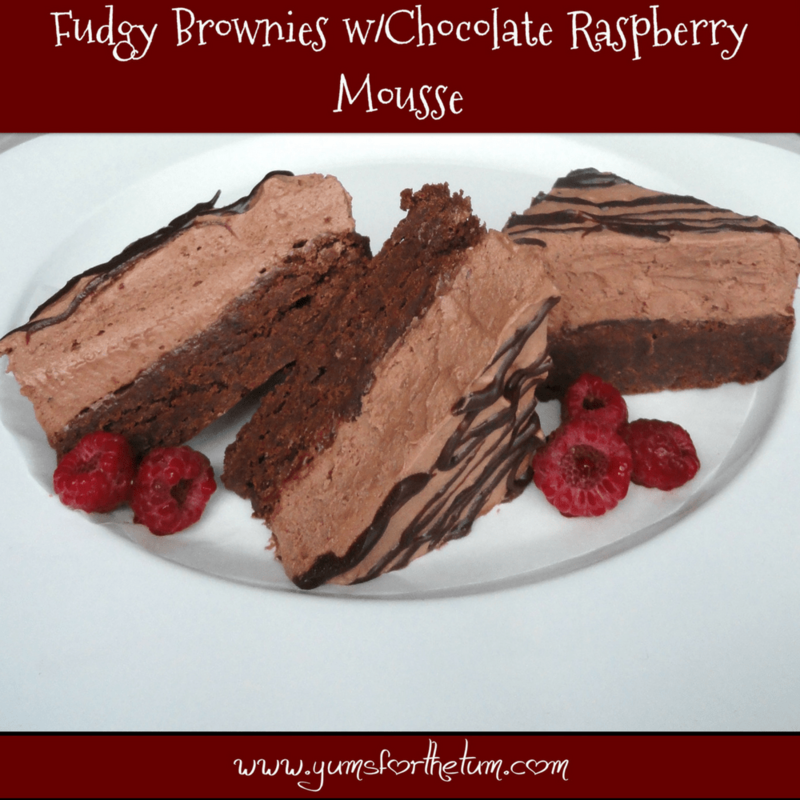 Dense, rich & fudgy brownies paired with light and smooth chocolate raspberry mousse that melts in your mouth. These brownies are a truly decadent dessert that are fancy enough for a special occasion yet easy enough for whenever the mood strikes. Melt the butter, chocolate and cocoa powder in a large-sized saucepan/dutch oven over medium-low heat, stirring constantly until smooth and completely combined/melted. Do not let the chocolate scorch on the bottom of the pan because scorched chocolate does not taste good. Pour into the prepared pan, spread evenly and bake in the preheated oven for 25-30 minutes or until toothpick inserted into the center comes out almost completely clean. (I find brownies to be fickle and the cooking time tends to vary from oven to oven, so start watching them after the 25 minute mark). Remove from oven and allow to cool completely. While the brownies are cooling, make the chocolate raspberry mousse. Begin by making cream cheese frosting. Cream the butter and cream cheese together in a small mixing bowl, using an electric handheld mixer. Slowly add in the powdered sugar, mixing on low speed, until smooth and creamy (depending on how packed in your sugar was in the measuring cup, you may need slightly less or more than 2 cups. Add it in slowly so you can stop when it gets to the right consistency). Add in the vanilla and mix until thoroughly combined and frosting is smooth and creamy. Set aside 1 cup of the frosting to be used for the mousse (there will be a little bit more than that). In a medium-sized saucepan over medium-low to medium heat, melt the chocolate chips with the whipping cream/heavy cream and the raspberry preserves/jam/jelly, stirring constantly. Once the chocolate is completely melted, add in the raspberry extract, stirring to thoroughly mix in, then set the saucepan in the refrigerator for about 30 minutes for the mixture to cool enough so it thickens up. Once the chocolate raspberry mixture has thickened, remove from the refrigerator and transfer to a medium-sized mixing bowl. Add in the 1 cup of reserved cream cheese frosting and then beat on high speed using an electric mixer for about a minute or so until the mousse is thoroughly blended and fluffy. Spread the mousse over top of the cooled brownies and spread out evenly over the top. Place the reserved 2 Tbsp. of chocolate chips and 2 tsp. of heavy cream/whipping cream in a small microwavable dish. Heat on 50% power in 15 second intervals, stirring after each interval, until the chocolate melts completely and the mixture is completely smooth. If the mixture is too thick, add a tiny bit more heavy cream/whipping cream and heat about another 5 seconds, then stir until thoroughly combined. Drizzle over top of the mousse. I placed the chocolate mixture into a small ziploc bag, then cut off a small hole in one of the bottom corners and used that to drizzle over the top. Loosely cover the brownie pan (try to avoid the cover sinking down into the top of the brownies, as you will lose some of the chocolate drizzle when you remove the top) and refrigerate for at least 1 hour (closer to 2 is best) until the mousse is completely set/firm (if you cut into these too soon, it will be very messy as the mousse is super soft at room temperature). Once the brownies have thoroughly chilled and mousse is set, remove from the refrigerator and then lift the brownies out of the pan using the sides of the foil to lift up. Serve brownies straight from the refrigerator or after sitting out at room temperature for about 20 minutes (straight from the fridge the mousse is a bit thicker and obviously the brownies are cold. After sitting out a bit, the mousse is much softer and they are no longer cold. I don't recommend microwaving these brownies, as the mousse will melt off if heated too long).